Displayed below is EventOnline's toolbox. Click to read more. 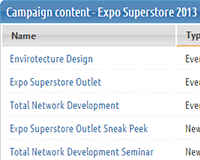 In the campaign module, you get a better overview of your different events and activities. You can link several different kinds of ocurrences to any one given campaign. 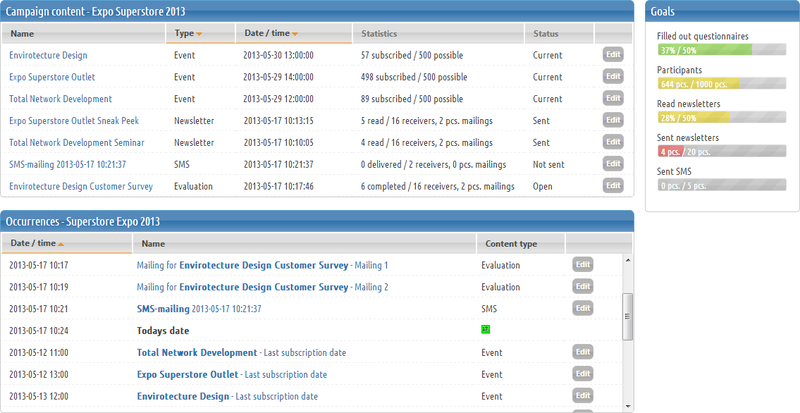 Occurences can be for example number of participants in an event, answered surveys, sent newsletters or sent SMS. A campaign with linked content. Using every given goal value indicator, you can see how many percent is left before the specified goal value is achieved. Using statistics tags with a link to groups in events, it's possible to display statistics on an even deeper level. See how many recipients haven't responded to a questionnaire, grouped by county or organization. See how many participants have unsubscribed, grouped by e g. post number, area or other designation.